Vershire is a tiny community just west of Fairlee, Vermont. 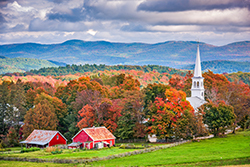 The Center of town sits on a ridge overlooking the New Hampshire Upper Valley. Vershire is predominantly a bedroom community with the majority of residents commuting to Hanover. Vershire is home to the Mountain School of Milton Academy, which offers programs that focus on sustainable agriculture. For horse enthusiasts, The Vershire Riding School offers a variety of programs for children and adults of all abilities. Scroll down to find all current real estate for sale in Vershire, VT. Contact us if you have questions or would like to learn more about a listing. To learn more about Vershire, click here! Fantastic opportunity to own a property on over 44 acres of beautiful land with amazing potential! The two existing buildings were used as multi-family dwellings, and the property boasts lovely mountain views in a quiet, wooded and private setting. One building is a fixer upper that could be stunning with some love and attention to detail, the other might need to come down, leaving plenty of potential and opportunity! This property features a lot of history, including a small memorial to mark the highest point in the town of Vershire. The lot features enough area for animal fields and pastures and would make a great farm with stunning views. On site includes drilled well, septic, and power. There is also potential to create a build lot on the other end of the property and build a driveway coming in from Durgin Hill Rd on northern property boundary. Endless possibilities await! Country retreat surrounded by 60 acres of natural beauty for vacation or year round living in rural Vermont. Private and meticulously cared for 3 bedroom 2 bath light filled modular home only 32 minutes from Hanover, New Hampshire. Living room features hard wood floors and fireplace. Savor nature's beauty from the deck off kitchen/dining area. Basement with wood stove is partially finished and offers many possibilities. Solar electricity backed up by generator. Something for everyone at this versatile property! Privately sited on 16.2 acres, this impressive young Cape has much to offer: country kitchen with granite counters, high-end energy efficient appliances, and built-in hutch, light-filled living room with hardwood floors, main floor master suite with vaulted ceiling, hardwood floors, French door to patio, and five fixture bathroom with oversized tiled shower. Upper level features two generous bedrooms and full bath. Walk-out lower level offers media/exercise room, mud room, and laundry room. Fabulous covered porch area to enjoy the serene view, watch the wildlife, and overlook your own private pond. (There's even a plum tree!--you'll need to pick them before the deer do!) Heated 900 sq ft garage with oversized doors and carport/equipment port off both the side and rear, too! All this plus trails galore to hike. Rare offering in the highly ranked Rivendell Interstate School District. You walk through the door of your simple country Cape. Each room is penetrated by natural sunlight so twinkling and present it warms your heart and spirit on a cold winter's day. Hot cocoa is bubbling on the stove; grab a cup and sit back in your rocking chair. Take in the majesty of the White Mountains of New Hampshire from your east-facing living room. You know tomorrow will be a beautiful sunrise as it is most everyday. Time to head back out and shovel off the deck. Summer's coming in a few short months and BBQs await. Manhattans, Martinis, or a simple Pop will be enjoyed after 5 and you and your guests will chat and watch the sunset over the Green Mountains. Come Autumn, harvest the apples from your heritage orchard to make a pie or perhaps just let them fall to feed the ample wildlife ever present for your amazement. Witness the collage of colors that blanket the valley; stunning! This unique property, complete with a post and beam Cape home is an oasis to come home to everyday. Panoramic views and open in all directions. Second home or primary residence, the new steward will write in its rich life history. See what awaits! Gorgeous estate property set on 195 ac. Only 25 min to Hanover and 30 min to the DHMC. The 12 acre lake is the centerpiece and gateway to this amazing nature preserve. Enjoy wide varieties of wildlife right from your hillside vantage point. Long drive off of a quiet gravel road takes you to the a knoll with sweeping lake views from this one of a kind residence. Designed and constructed by a world-champion yachtsman with the architect of Loon Mtn resort in the early 60's, then substantially renovated from 2000 to 2006. Technologically ahead of its time, this home was featured in Sports Illustrated in 1965. This three BR, two BA solar powered residence is currently off grid but power lines, telephone, and fiber-optic are only 1000 feet away. Owner installed 16 new state-of-the-art maintenance free Rolls 6V AGM Solar batteries in Jan. 2019. Batteries do not require water nor equalization. Power quotes are also in progress. Renovations include a cleverly designed kitchen with cherry, granite and stainless appliances that nods to the original circular great room and grand semi circular stone fireplace. Other features; granite, cherry and slate flooring, a jotul oslo wood-stove, cast iron tub, sauna, steam, heated garage and first floor BR. Heated with forced hot water sub-floor radiant heat and a Buderus boiler with flat panel radiators. Home also has a fireplace, wood stove, and sauna heater. Alternate sites for construction of additional structures. An incredible retreat! Nice large piece of mixed wood and some open land. Property currently has a mobile home on it which is being removed. Located close to the Mountain School. Gently sloping land, beautiful private setting, lovely views, sunny south west exposure, cross country ski trails, woods, roads, hunting, great buildings sites.There are restrictions against mobile homes being located on this land. Listed by Vincent Pacilio of Valley Associates of Bradford, Inc.